Louis Neglia’s Ring of Combat has continuously provided some of the best in regional mixed martial action. Current and former UFC fighters will be working corners, sitting in the stands, and perhaps getting a birds-eye view of future UFC champions battling in the cage. The list is long and impressive of ROC alum who have gone onto the bigger stage. Frankie Edgar and Chris Weidman are both former world champions who have made their bones in Atlantic City, inside the Tropicana Showroom, honing their skills. They are just two of the more than 120 warriors who have earned that UFC paycheck after having success fighting for Neglia. Friday, September 15 promises to be another night filled with quality fighters and high level match-ups. Some of the best fight camps in the entire sport will be on hand and involved. 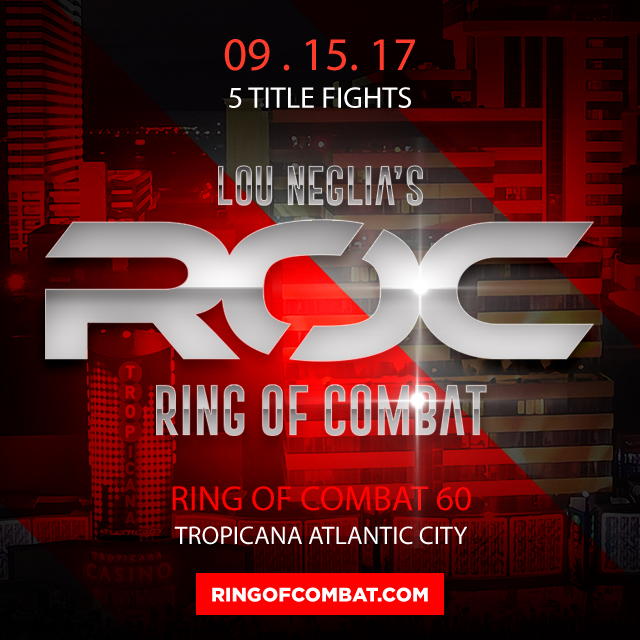 Neglia loves championship fights, and ROC 60 brings us five of them. Check out my preview. We will be cage-side with up to the minute results, photos, and a full recap. Keshtov is representing the K-Dojo Warrior Tribe and is one of the top prospects on the east coast. He is a high level grappler and has quickly evolved his entire arsenal while remaining undefeated. Simply put, Keshtov is a machine. James Quigg is a military Veteran who was 5-0 as an amateur and now is 3-0 as a professional. He fights out of North Carolina. I haven’t had the pleasure of seeing him perform before, but his résumé speaks for itself. A tremendous match-up of two fighters who have yet to lose a fight. ‘The Predator’ Stephen Regman honed his striking skills at Tiger Schulmann MMA and has switched camps to Pellegrino MMA. Kurt Pellegrino has worked Regman’s ground game to the point where he has confidence that wherever a fight leads him, he will be victorious. He fought in front of UFC president, Dana White in his last fight (a 3rd rnd TKO), and feels he is definitely on their radar after speaking with the man himself. His opponent, Anthony Giacchina, is fighting out of Maximum Brazilian Jiu-Jitsu in NY. Giachinna is coming off of a very impressive 3rd round submission of Jerome Mickle on the Bellator NY card. Regman’s ground game may be tested in this battle for lightweight supremacy. Taj bounced back with a victory at ROC 59 after suffering his first loss against Sidney Outlaw at ROC 58. There is no shame in that, as Sidney has since gone on to fight and win on Dana White’s Contender Series. Outlaw is an excellent fighter and the “Black Spartan” has surely learned from that loss. Taj brings “beautiful violence” to the cage as he uses a wide variety of knees, elbows, kicks, and combinations to try and finish fights. He is a very exciting mixed martial artist and is working hard to get the belt that eluded him two fights ago. 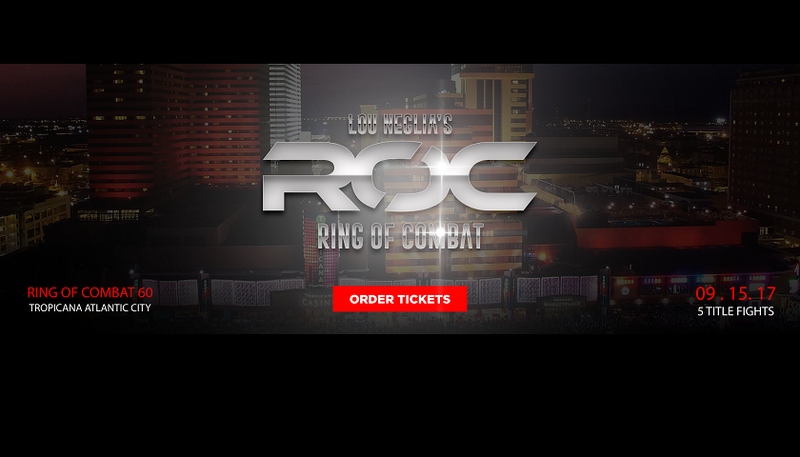 Hosch, out of North Carolina’s Darkside MMA, is coming off of an elimination fight at ROC 59, where he earned the title shot with a unanimous decision victory over Mike Elshamy. Not one of the Warheads’ opponents has had a losing record as he has constantly challenged the best opponents he could find. This has the chance to be an all out war. The Viking is the former middleweight champion. Unable to secure a rematch with Ruslan Melikov, who has vacated the belt, Roncoroni gets his chance to reclaim what he says is his. It will be almost a full year since Roncoroni has last fought, but that has not stopped him from traveling and training with the elite of the game. He’s also been with American Strikers and Don Cioffi from day 1 and is a slugging southpaw with a huge heart, who worked with Billy Dee Williams of Beyond Fitness to get him in the best shape of his life. It may seem odd that his opponent only has one fight, but Samir, who is 30 years old, has years of experience with the Egyptian National Boxing Team and has entered the MMA field with a victory. Both of these fighters like to stand and exchange. This very well may not go the distance and could be fight of the night. This is a rematch of two blue chip prospects who faced off in their professional debuts eighteen months ago at ROC 54. Trizano got the win with a unanimous decision. Mike fights out of Tiger Schulmann MMA fight team, who have made a regular habit recently, of getting fighters to the next level. UFC 135 lb championship contender, Jimmie “El Terror” Rivera, “Hurricane” Shane Burgos, and a host of other top shelf training partners have helped Trizano prepare for this rematch. Trizano is actually replacing his TSMMA teammate, Julio Arce who withdrew to fight (and win by TKO) on the new Contender Series by Dana White. The “Lonewolf” promises that he will not take Gonzalez lightly because of the result of their first encounter. James “Speedy” Gonzalez has rebounded with 4 straight wins and is improving daily working with his team, Serra-Longo MMA. His BJJ is his strength, but has continually worked hard on his game and tells us that he is a different fighter than the one who fought Trizano before. Both of these fighters have next level skills and aspirations. This will be a barn-burner. I’m very excited for this fight. Brandon “Mega” Urquijo vs Phil Caracappa 135 lbs…Brooklyn MMA’s Urquijo (2-1) is coming off of his first career loss in a title fight. He’s a well conditioned bulldog and is very excited about getting the taste out of his mouth from his defeat. 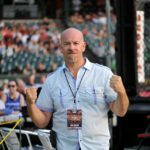 His head trainer/coach Terry Gold has him mentally prepared to go into the cage against lifelong wrestler, Phil Caracappa (2-0). Phil has really taken to striking coach Brian Wright and works with BJJ mastermind Dante’ Rivera. Caracappa says that despite his wrestling background, he plans on going toe to toe with Brandon and seeing who the better man is. Caracappa also said that he expects this battle could be fight of the night. The winner in this one, may get a title shot. Hold onto your seats for this one. Tim Dooling (6-3) vs Kenny Foster (12-11) 145 lbs…Doling, out of Dante Rivera BJJ, was very impressive in a loss to Julio Arce. Dooling was coming off of 5 consecutive wins and took the fight on short notice against Arce who has since appeared in the UFC. Foster is coming off of a win at CES and has fought some of the best fighters in his weight class like Alexander “PoPo” Bezerra, Claudio Ledesma, Andy Main, and Mike Santiago . He ducks no one. He is a savvy veteran who brings it every time.